Contents and Media: One decal sheet; double-sided full colour instruction sheet. Advantages: Colourful markings on grey planes; high quality printing; good timing with recent re-release of big 1/48 scale kit and Paul Boyer's article on the 1/72 scale kit in FSM. This release is the final offering in the Cutting Edge trilogy of B-1sheets. 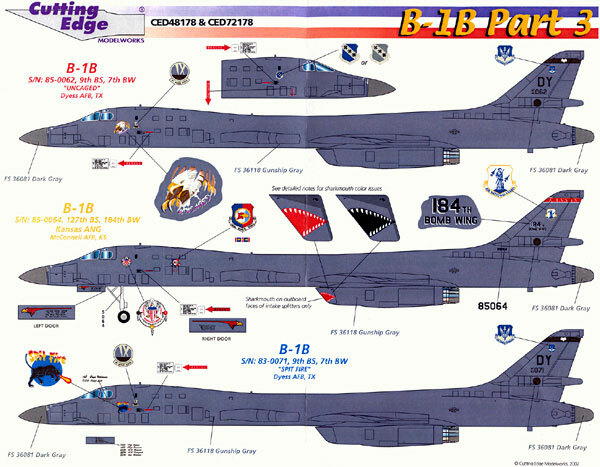 This sheet provides markings for three instead of four B-1Bs. But hey, these ones are colourful! Nose art of a full colour Bald Eagle seemingly emerging from a hole that it has ripped in the fuselage with the title “UNCAGED” in a patriotic red, white and blue. 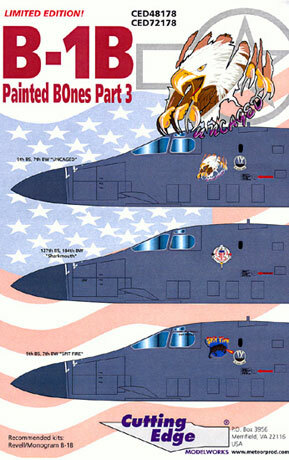 The nose art appeared on both sides of the fuselage and Cutting Edge has provided three of them. No mention of this is made on either the decal placement guide or the instruction sheet but I’d guess that they were unsure if the starboard side was “handed” so they have hedged their bets and provided both options – a nice touch. · Subdued Air Combat Command badges for the top of the fin. · A black tail band with a white bat. · A set of black serial numbers for the tail and a DY Wing identifier for the tail. Subdued squadron and Bomb Wing badges for the nose – the Bomb Wing badge was seen with a blue background at some time so Cutting Edge have provided both options. Red rescue arrows and black stenciled rescue date finish off the markings for this aircraft. Full colour Wichita Intertribal Warrior Society badges for both sides of the fuselage. · Full colour 148th BW badges. Again, on both sides of the fuselage. · Full colour ANG shields for the top of the fin. · Red bands with white edges and KANSAS lettering for the top of the fin. · 184th BW titles in black with white “shadowing” for the fin. The BW’s red eagle markings in full colour for the left and right nose undercarriage doors. Two different sets of “shark mouths” for the engine intakes. Again, it was uncertain if these were either red or white so both options are supplied. · A pair of full colour campaign ribbons. · A set of stencil style stars and bars. A set of red rescue arrows and black stenciled rescue instructions. A set of the “last four” of the serial number for the front undercarriage leg. Nose art in the form of a black panther (?) spitting red and yellow “fire” superimposed over a blue circle with the “Spit Fire” script in red and yellow. As with the “UNCAGED” option, a “handed set is offered. · A black tail bad with a white bat. · A set of black serial numbers for the tail and a DY Wing for the tail. · Red rescue arrows and black stenciled rescue data. · Black stenciled ground crew names for the nose undercarriage door finish off the markings for this aircraft. 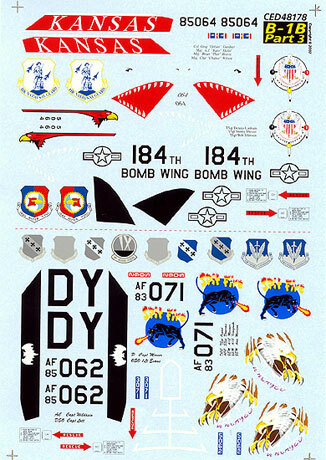 Decal placement is provided via the standard full colour double sided sheet with a further sheet providing notes on each aircraft. A good sheet that provides diverse and colourful marking options for a relatively drab looking colour scheme. Thanks to Cutting Edge Modelworks for the review samples..